I bought a big bag of apples the other day for what I thought was a great deal, until I realized later that they were really really ripe. Like they already smell like apple cider instead of fresh apples, ripe. Oops. 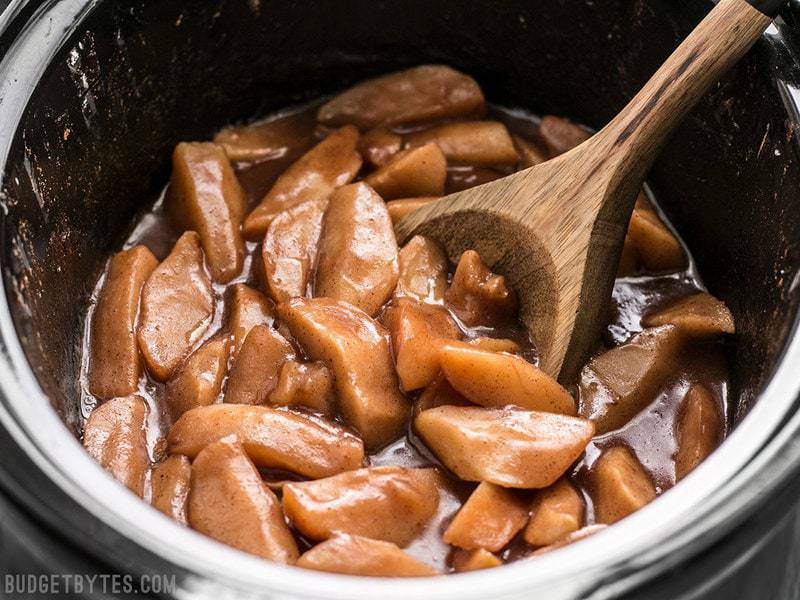 But I wasn’t about to let that bag of 12 apples go to waste, so I peeled and sliced them, tossed them into the slow cooker with a healthy dose of warm spices, a little sugar, cornstarch for thickening, and a few big pieces of butter. Already sounds good, doesn’t it? After a few hours in the slow cooker the apples were tender, sweet but not too-sweet, and had my house smelling like an autumn dream! The mixture ends up very much like the filling for an apple pie and is very versatile in its uses. You can treat it like a crustless pie and serve it à la mode like I did below (with a little granola sprinkled on top), spoon it over your pancakes, waffles, or oats, use it as a filling for a dessert “quesadilla”, or even serve it along side something like pork chops. This is obviously a huge batch because I wanted to use that entire bag of apples, but you can easily halve this recipe if needed. 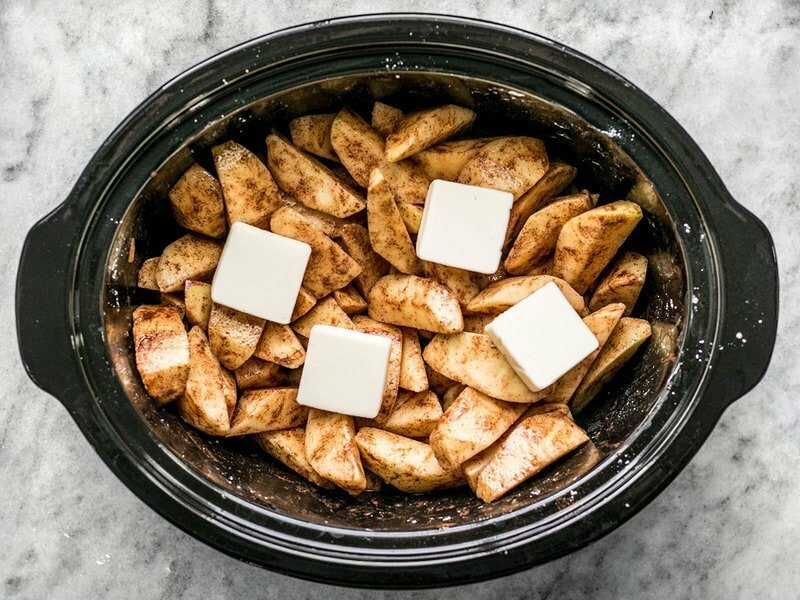 While the Slow Cooker Hot Butter Apples do stay good in the fridge for 4-5 days I’m not sure that they will freeze well due to the cornstarch (although I haven’t had the opportunity to test this yet). One more note about the type of apples used vs. the amount of sugar in the recipe. I used very ripe Fuji apples, which were fairly sweet with just a hint of tartness. 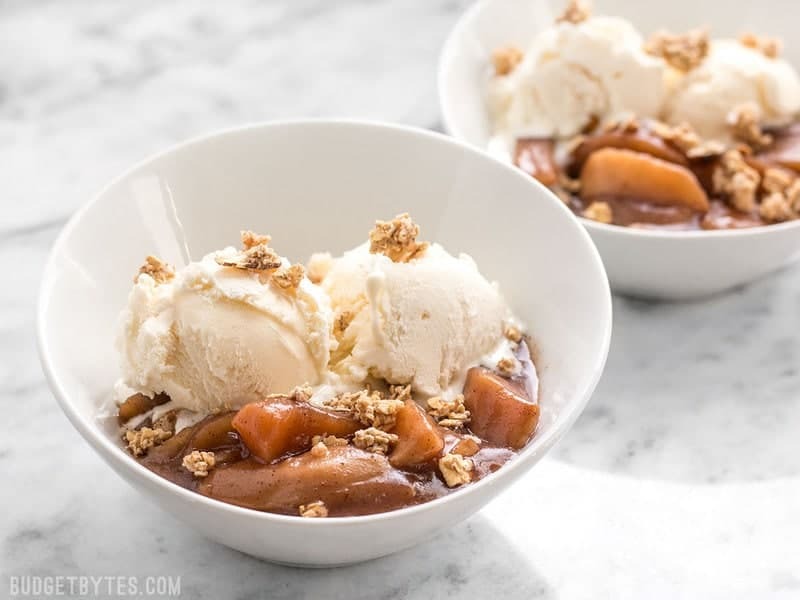 If you use a very tart apple like Granny Smith, you’ll likely want to increase the sugar in the mix, but that’s going to depend on your personal preference. 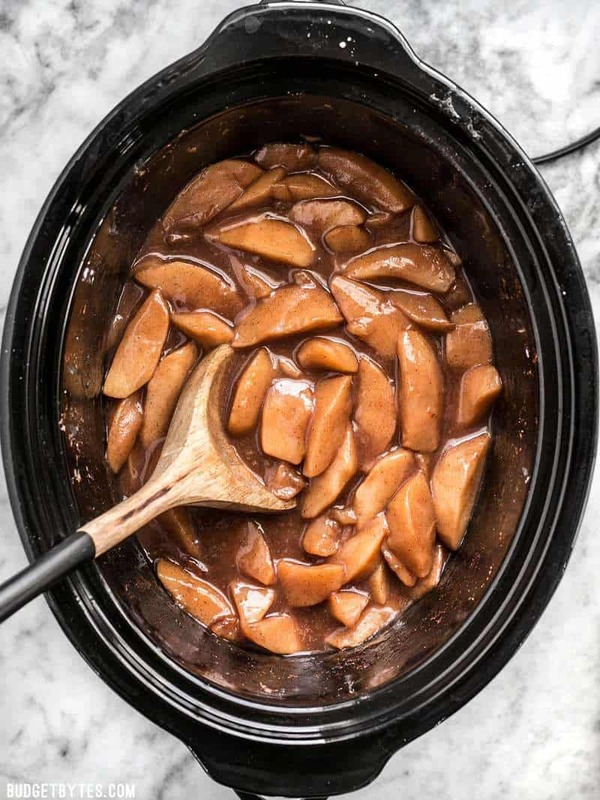 Slow Cooker Hot Buttered Apples are an easy and versatile dessert that is perfect for using up your glut of autumn apples! 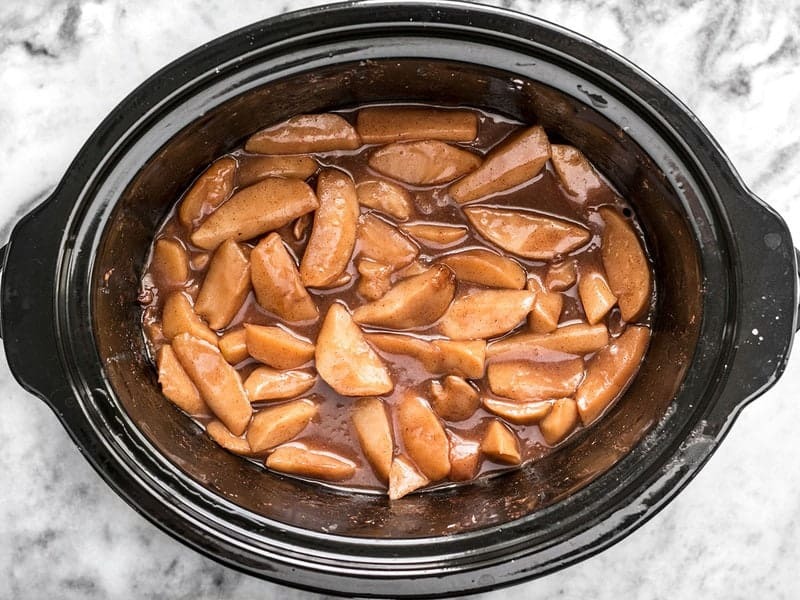 Peel and slice the apples, then place them in a slow cooker (4 quart or larger). Add the lemon juice, brown sugar, cinnamon, cloves, vanilla, salt, and cornstarch to the slow cooker, then stir to coat the apples in the spices. Divide the butter into pieces, then place the butter on top of the seasoned apples. Pour 1/2 cup water into the cooker down the side so that reaches the bottom without rinsing the spices from the apples. Place the lid on the slow cooker, set it to high heat, and cook for two hours. After two hours, stir the apples well, replace the lid, and cook for an additional one hour, then serve hot. *I used Fuji apples but any sweet-tart apple will work. SERVING IDEAS: with granola and ice cream, as a topper for pancakes, waffles, or oatmeal, inside a toasted tortilla as a dessert "quesadilla". 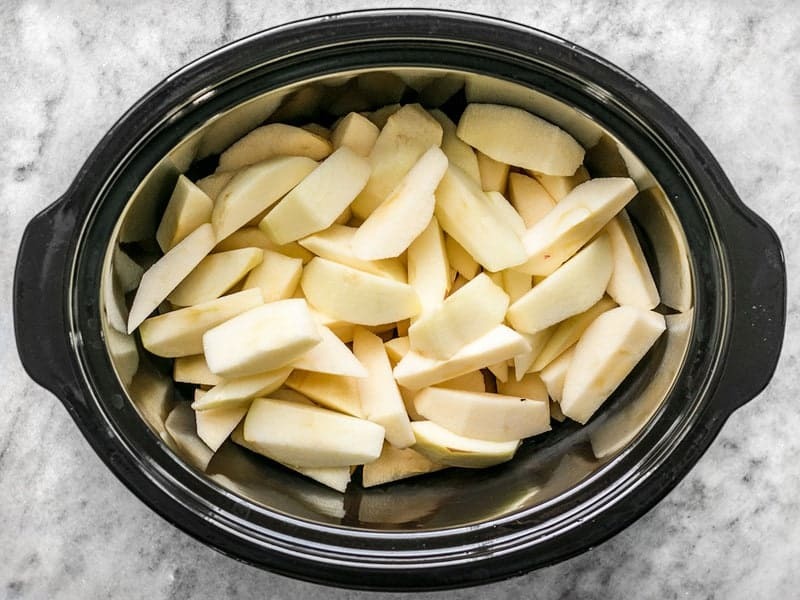 Peel and slice about 12 small apples (about 2-inch diameter) and place them in a slow cooker. For this amount of apples, you’ll probably want to use at least a 4 quart slow cooker. 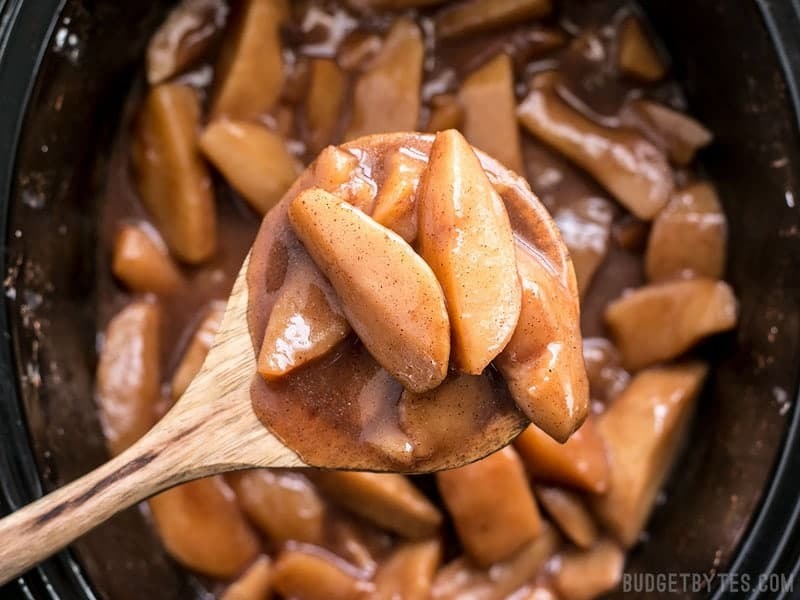 Add 1 Tbsp lemon juice, 1/4 cup brown sugar, 1/2 Tbsp cinnamon, 1/2 tsp ground cloves, 1 tsp vanilla extract, 1/4 tsp salt, and 3 Tbsp cornstarch to the slow cooker, then stir to coat the apples in the spices. Cut the butter into a few large chunks and place them on top of the apples. Carefully pour 1/2 cup water down the side wall of the cooker so the water reaches the bottom without washing the spices off the apples. Place the lid on the slow cooker, set it to “high” and cook for two hours. After two hours, stir the apples, replace the lid, and cook for one more hour. Then EAT! 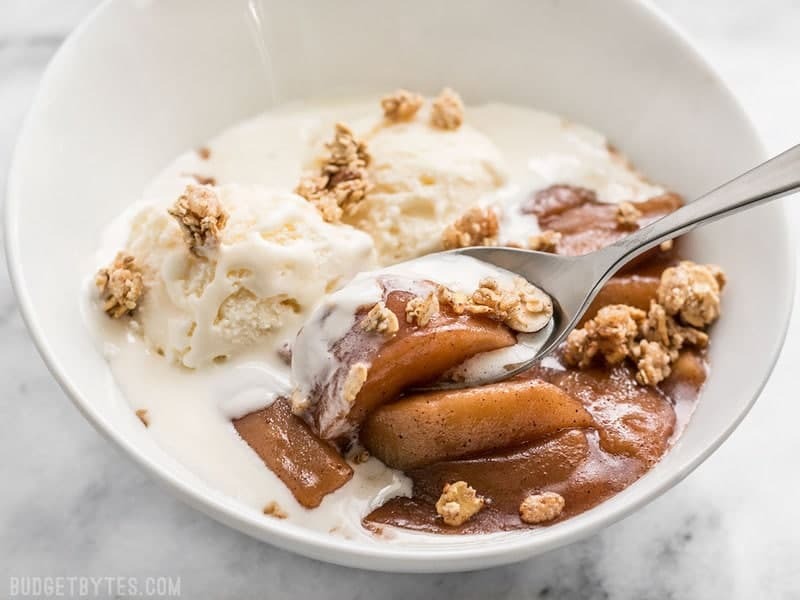 The reason I like these apples is because they are sweet but not so incredibly sweet that they can’t be use to top something healthy like a bowl of oatmeal. They’re about as sweet as applesauce, but with a deep richness from the butter and vanilla. SO GOOD. I have everything on hand except the lemon. Will it make a big difference if I don’t add the 1 Tbsp lemon juice? Can these be reheated on the stove? what about adding cranberries for Thanksgiving??? I am thinking about the same thing! What would the ratio be if we decide to add fresh cranberries? Do we need to reduce the number of apples used or can we just add a cup or two of berries and not change the rest? This is just a guess, since I haven’t tried adding cranberries, but if I were to test it I’d first try just adding the cranberries in without making any other changes. Delicious! I made it even easier by not peeling the apples. The skin softens and you would never even know they were not peeled. Terrific with ice cream. After crockpot shut off they stayed nicely warm for another 2 and 1/2 hours. What a great idea! So much faster, and more nutritious too! I’m looking for a copycat recipe of the cinnamon apples that Boston Market once had. Do you think this is it? So if I would make it 1day before needed, do you think it would be alright reheated in crock pot?Just wondering. Yes, I think that could work. If it gets dry or too thick while reheating, you can stir in a little bit of water. This is delicious! Served it over vanilla bean ice cream last night, had some on oatmeal today. Great way to use the big bag of seconds we got at the orchard. Do you think this would freeze well? I have tons of apples as well and this sounds perfect to make. Thanks! I haven’t had the chance to test freezing these to be certain, but sauces thickened with cornstarch do tend to separate upon freezing and thawing. Do you think this could be done without a slow cooker? It looks heavenly! I tried it and it was perfect and delicious. I’m wondering if I could do it again but this time adding a couple kinds of berries… Do you think that would work? I bet raspberries would go great in there!